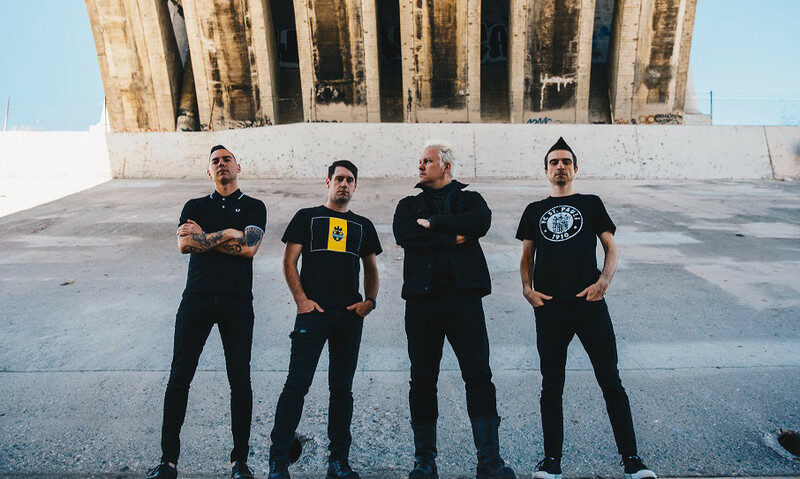 Anti-Flag’s Justin Sane talks Donald Trump, working with Benji Madden and his band’s new album ‘American Fall’. Says Justin Sane (vocals / guitar): “What was important for me, writing this record, was that we made sure people knew there was a solidarity out there. “The beliefs that we’ve always held important as a band, people still share them. It felt like all of a sudden, ‘Okay, racism, homophobia, sexism, transphobia, Islamophobia… there are people in positions of pretty high power and influence saying that these things are fine now.’ For that reason, I felt like it was important to say to our community – and the greater public as a whole – that no, these things are not okay. HOW DID THAT FILTER INTO THE LYRICS? “With the song ‘Racists’ for example, we just named it what it is. ‘This is what we’re dealing with, this is what’s going on.’ That song identifies those people who don’t even realise they’re supporting a systemic racism, a culture of oppression. IS IT A KIND OF CALL TO ACTION, TOO? “I was just on tour in the States this summer, and numerous times meeting people, they’d come up and say ‘I was asleep, I was apathetic and didn’t care. I care now’. “If there’s any silver lining to what we’re facing right now, there will be a backlash to this. The reason people like Trump and his supporters are striking out is because they’ve had a special privilege. These people feel like it’s starting to be eroded away – that’s why they hated Obama so much. It was like ‘Oh, but that’s a white guy’s job.’ That’s why Trump was so threatened by Obama, even know now he’s in the White House, he’s just continuing a lot of his policies! “Luckily the younger generation aren’t okay with just one group of people having that privilege. Equality being spread about can only be a good thing – we feel secure enough in ourselves that we don’t need that special privilege. HOW DID BENJI MADDEN END UP CO-PRODUCING THE RECORD? “It was amazing. The funny thing is, Benji was basically producing the record before he was officially producing the record. “When we were just starting out we spoke to him, and he was like ‘Hey guys, we have a studio in L.A., why don’t you just come up here and work on the record here? Get away from the distractions of your life and just hang out.’ We took him up on his offer, were working on the record, and he’d pop in to hear what we were doing. He’d be like, ‘That’s really cool, maybe you should take it in this direction. This is interesting, maybe try doing this with it’. SO HE WAS EASY TO WORK WITH, THEN? “Benji has two incredibly strong attributes. He understands what people need to complete a project, and finds a way to provide it. He does this all the time – he’s just a really great guy who tries to help people out, a genuinely giving person. WHAT KIND OF EFFECT DID HIS INVOLVEMENT HAVE ON THE MUSIC? “I definitely think he had some influence in that way, because there were times when he’d go ‘Oh man, this song reminds me of The Clash’, or something like that, and he’d fine tune something for us or dial us into something we might not have seen on our own. That helped make the record stronger. “These are dark times for a lot of people. Even a song like ‘Racists’, it’s actually packaged in something pretty catchy. It’s the same thing with a good few songs on the record. I think in the end, that’s a positive. YOU DELIBERATELY MADE A MORE ACCESSIBLE RECORD, THEN? “A great man by the name of Billy Bragg once told us that you catch more bees with honey. I think there’s a lot of truth to that. You can’t always control what you end up writing, how a record is going to sound, but I do think you can be cognisant of how you present something, and steer it in a certain direction. “It wasn’t 100 percent like, ‘Let’s make some lighter songs’, but there was a little bit in the back of our heads. Of course there are some heavier punk songs on there, but I like to write the music I love to listen to. My favourite bands are Social Distortion, Bad Religion, The Clash, so when I write a song I enjoy when a song sounds like one of them. YOU WERE VERY VOCAL IN ATTACKING GEORGE W. BUSH’S ADMINISTRATION BACK IN THE ’00S… DO YOU FEEL LIKE PRESIDENT TRUMP REQUIRES A DIFFERENT RESPONSE? “I learned long ago not to hinge my hopes on a president. Under Bush and Obama we had record incarceration and deportation in the United States, we had a record military spending, we have our longest war, which continues to this day in Afghanistan. “The actions of presidents are shaped by public opinion, though Trump is slightly outside of that trend. He’s catering to an extreme base that he’s hoping will keep him in power. The way my view has changed about politics is that we’ve learned a lot of lessons, in the time between Bush and Trump. When Trump is gone, and he will be someday, hopefully we’ll be able to build a more progressive coalition and roll back some of the damage he’s done. “But, what’s really going to be important is to ask people to stay engaged, to not become apathetic. I think people became burnt out after Bush – ‘Obama seems like a cool dude, so we’re going to check out.’ We found out that things weren’t cool. I just want people to be engaged just enough so that people like Donald Trump don’t get elected, and we’re not dropping bombs on people all over the world. It doesn’t take a lot. DO YOU FEEL LIKE YOUR MUSIC IS MORE RELEVANT THAN EVER, GIVEN ALL THAT? ‘American Fall’ is out on November 03 via Spinefarm Records.